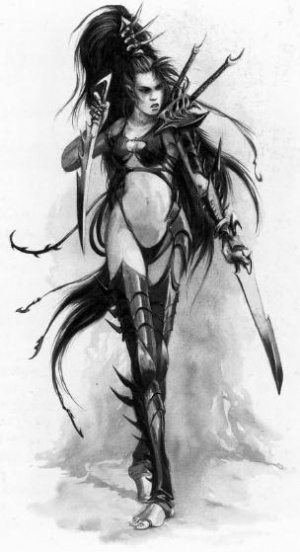 So I recognised a trend with the new official artwork from GW and i wondered, what the hell happened to Lelith? What happened? Is it GW trying to make the "Aeldari" more non-human looking? Are these the effects from Lelith loosing her Combat Drugs? Was this the same artist from The Gathering Storm and what do you think about the new "most beautiful woman in commoragh" ? Your spoiler hides nothing. Did you want to show us a picture? Never mind. I can see it when I'm not using the app. Hm... she definitely looks sick. Maybe it's the draining effect and old age? GW has been heavily utilizing really terrible watercolor illustrations lately. I can only assume it is to save money because there's no other reason for it that I can see. The Daughters of Khaine book is an affront to the eyes, and the Dark Eldar book is no better. Something tells me there's an undercurrent of making everything ugly on purpose because something something boobplate sexual objectification but really this is all their art now and it's just atrocious. I guess she waited too long to stop taking drugs. Yeah, I can't say I'm overly impressed by their newer artwork. The watercolour stuff just looks awful. It has this weird blurry/overexposed look that just comes across as an attempt to disguise how half-arsed it is. I think part of the issue is that the newer art doesn't really seem to line up with the look or feel of 40k. A lot of the old art had an appropriately gritty feel, but this is the opposite - it's like bad CGI that looks far too clean and lacking in texture. all the while poster gal yvraine looks """"normal""""
The new watercolour stuff reminds me of Guild Wars 2. I don't mind it so much but it does kinda make me think they probably wanted a messy John Blanche look but didn't quite get there. GW has been heavily utilizing really terrible watercolor illustrations lately. I can only assume it is to save money because there's no other reason for it that I can see. The recent Dark Angels codex suffers from this as well. The "legacy" artwork from earlier editions looks great, but most of the new artwork (including all the Primaris illustrations) looks very cheap in comparison. Most of the new Codex is actually Photoshop digital painting, almost nothing is analog now. Things like this become very apparent when you look at, say, that atrocious double page spread they've got for the start/ end of the books and on page 4/5. It's gritty and realistic - but too clean. At the same time, all of the Kabalite's have these weird little triangle cones as their back-plates as opposed to the segmented spine armour bracketed by energy sumps. For a second, the Incubi are lacking their famed back-spines and all of the armour just looks... wrong. Like its poorly faked. Add to that, the composition is crappy, there's very little going on in the foreground and the background is just big empty space with nothing of note to observe beyond some spiky specks we infer as a webway portal and some fliers. Then you look at pages 72 and 73, which gives you a lovely comparison of the 5th ed Talos art (colourised) in all its gritty glory next to the new-style art of the Cronos. And whilst it's not a bad rendition of the Cronos, that side by side really highlights the difference in styles for me. Or again, their pseudo-Wracks in the new style against the old-style Wracks. The new style just hurts my eyes, frankly. Incredibly simple, really. First picture is Lelith viewed with regular, mundane eyes. Second is Lelith, viewed with witchsight. But the reality of the situation is much simpler - the art is done by a massive host of freelancers and not just by a few guys in Nottingham within reach of hundreds of other works of art in their original ttaditional form to draw inspiration from. So we see a large variety of aetwork quality and detalization, as there is a large difference in what a given artist sees the project they work on like. For example, the 8e codex art has a very unflattering, next morning without makeup sort of look for the Drukhari - and while not quite my favourite depiction, I still quite like them because it fits who they are, it is one of the points they go to such savage lengths to feed and regain their youthful looks. When it comes to artwork of auch large settings, I find that the more artists look at it, the more nuance the world gains as a reault, as each gives a slightly different depiction. Like the drawings of untold thousands rememberancers paint a vastly different picture of the Great Crusade, so too are the glimpses of such an eerie and ethereal people like the Eldar. - The Archon bears such resemblance to a potato that someone has lodged a peeler in the top of his head. Also, he's looking in completely the wrong direction. And did he literally bring a bunch of skulls with him so that there would be something dramatic at his feet? - The Incubi appear to be wearing armour that's about 3 sizes too big for them. - Most of the Warriors are just standing awkwardly around and the one with a gun looks like he's never held one before. He's making a worthy attempt to not point it at any of the actual enemies. Safety first, I guess. - The Venom's Splinter Cannons have exactly the same muzzle-flashes as the SM Bolters, in spite of them being entirely different weapons. Also, the Venom's upper Splinter Cannon appears to be blatantly shooting at other DE craft. - The whole battle is really weird. You've got DE in the foreground and enemies in the background. Okay. But then quite a few of the DE - including the Archon himself - seem to be facing the wrong way. And then you've got more DE over to the left, in the background, yet many of them are facing forwards, away from the enemy they're supposed to be fighting. - There's no detail on anything. Look at the Archon on the cover. Now look at the Archon here. Bit of a difference, isn't it? The whole picture is a bunch of greenish blobs fighting a bunch of whitish blobs. First off, that first pic is from several editions ago, it's not remotely new. Secondly, it's a Farseer from Althansar, a Craftworld that spent most of the last 10 000 years stuck in the Eye of Terror, the inhabitants are a little warptainted these days. yeah ok but still, this was the guy that gave Yvraine her cat, wasn't he? That purple-robed pic is just terrible all on its own - little T-Rex arms and everything. Don’t tell me it’s perspective, the artist drew the sword, then the legs and torso, then the arms. Cheers for the dissertation on the picture that I knew was crap but couldn’t quite pinpoint why, Samurai. Oh - and apparently Wracks are psykers now. since when? what? why? how???? There’s a Wrack casting a glowy-blue light spell on a White Scars corpse in the bottom middle of the ‘artwork’. Looks like an artistic representation of soul manipulation of some kind, and that seems completely within the Covens' MO. That would also explain its expression. It's weird because it looks like the spell is coming from (or going into) behind the Wrack's hand. Like, there's no glow around the hand to indicate that it's casting the spell, but I can't see anything else that could be. It's probably not helped by the crack of the book, which makes it look like the soul is emerging from the buttocks of a nearby Kabalite. No, you’re right, the placement of the nearby Kab doesn’t help matters. Also, I didn’t actually notice the... lack of anything going on with the hand. And yeah, probably soul manipulation - I get that some Haemi’s happen to be Soothsaying pricks, but Wracks? Seriously? In the new image near the cult of strife, it's not lelith. Look at the name under. I think I'm missing something. It's the picture that appears on her page in the Codex, just above a quote from Vect talking about Lelith. Who else could it be meant to represent? I agree. I don't like the general aesthetic they gave to the new dark eldar. They don't have the evil spark they had before.